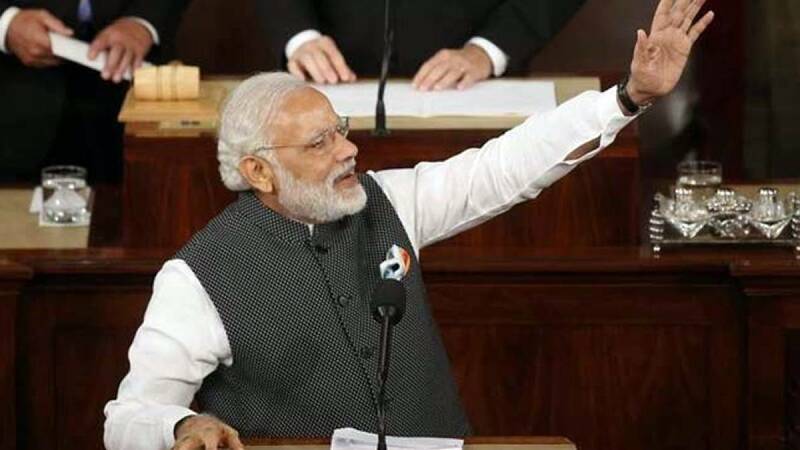 On Wednesday, PM Modi became fifth Indian leader to make a speech in the US Congress since 1985. While addressing a joint session of US lawmakers in Capitol Hill, Mr Prime Minister came up with jokes, talks over friendship and world's biggest threat terrorism. Here are 10 quotes from PM Modi speech that left everyone present there clapping. 1: Although it's (terrorism's) shadow is spreading across the world, it is incubated in India's neighbourhood. 2: Refusing to reward those who practice terrorism for political gain is first step towards holding them accountable.Those who believe in humanity must come together as one & speak against this menace in one voice. Terrorism must be delegitimized. 3: For my government, the Constitution is its real holy book. And in that holy book, freedom of faith, speech... equality of all citizens... are enshrined as fundamental rights. 4: India lives as one, India grows as one, India celebrates as one. 5: In California, the innovative genius of America and India's intellectual creativity are working to shape new industries of the future. 6: In Asia, the absence of an agreed security architecture creates uncertainty. 7: President Obama and I have agreed that India as a permanent member of the UN Security Council has to be an intrinsic part of this century's new reality. 8: My to-do list is long and ambitious -- skill millions of our youth, build 100 smart cities, have broadband for a billion. 10: Our relationship is primed for a momentous future. The constraints of the past are behind us.